Hours after PEMRA put news channels off-air, Pakistan Telecommunications Authority (PTA) has blocked Twitter, Facebook and Youtube in Pakistan. Following the Faizabad Operation, internet service providers have been ordered by PTA to restrict users from using these three social media websites. Earlier, PEMRA had also restricted news channels from live coverage of Faizabad Dharna. Telecommunication coverage also continues to remain suspended as the government makes efforts to peacefully control the situation. Law enforcement agencies are currently trying to scatter the protestors and clear the area, however, the situation remains tense. Police, Federal Constabulary and Rangers have been heavily deployed in Faizabad and adjoining areas. A wave of protests by religious groups has started across the country following the Faizabad Operation. Pakistan has a history of putting a ban on social media websites. Just last year, Youtube was unblocked in Pakistan after over four years of ban over blasphemous content. Instagram is also on the list of banned social networking websites. We have confirmed that Instagram is not working on PTCL, Nayatel and a number of other ISPs. Video sharing website Dailymotion also seems to be offline. 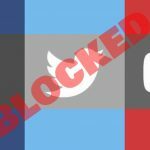 The number of blocked websites is currently 5 that includes Facebook, Twitter, Youtube, Instagram and Dailymotion. Meanwhile, the government has called the army to control the Faizabad situation that was only worsening before law enforcement agencies halted the operation this afternoon. There is still no confirmation about the duration of the ban on social networking websites.